This is a list of notable people who died either from the effects of excessive alcohol consumption or alcohol poisoning. The Journal of the American Medical Association defines alcoholism as "a primary, chronic disease characterized by impaired control over drinking, preoccupation with the drug alcohol, use of alcohol despite adverse consequences, and distortions in thinking, most notably denial." The majority of people in this list died from causes brought on by alcoholism. In some cases, they died of multiple causes, with alcoholism being a major factor. Exceptions to this are those who died from accidental death, such as alcohol poisoning caused by binge drinking. In these cases, misuse of drugs sometimes contributed to the person dying. Deaths caused indirectly by alcohol, such as in a car accident are not listed here. The table below lists people who died as a direct result of alcohol misuse. Dates of death are listed instead of dates of birth. ^ "JAMA – Abstract: The definition of alcoholism. The Joint Committee of the National Council on Alcoholism and Drug Dependence and the American Society of Addiction Medicine to Study the Definition and Criteria for the Diagnosis of Alcoholism, August 26, 1992, Morse and Flavin 268 (8): 1012". Retrieved 2008-05-21. ^ Spencer, Frederick J. (2002). Jazz and Death: Medical Profiles of Jazz Greats. University Press of Mississippi. p. 99. ISBN 978-1-57806-453-3. ^ "Football legend George Best dies". BBC News. BBC. 2005-11-25. Retrieved 2008-05-04. ^ Davis, Stephen (1985-07-04). "Power, Mystery And The Hammer Of The Gods". Rolling Stone. Retrieved 2008-05-14. ^ "Liquor Kills Ex-Actress". New York Times. 1927-12-25. ^ Basham, David. "10,000 Maniacs Guitarist Rob Buck Dies Of Liver Failure". MTV. Retrieved 2008-05-15. ^ "Richard Burton – Films as actor:, Film as director". filmreference.com. Retrieved 2008-05-15. ^ "Sleaze Roxx: David Byron". Sleaze Roxx. Archived from the original on 2008-05-09. Retrieved 2008-05-04. ^ Krebs, Albin (1984-08-26). 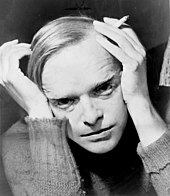 "Truman Capote is Dead at 59; Novelist of Style and Clarity". New York Times. Retrieved 2008-05-04. 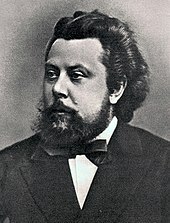 ^ "He died of drink.... During meetings he was often a bit drunk, and afterwards in Paris I saw him come to Mandelbrojt's apartment for an advance on the travel money due him, red-eyed, with a three-day beard." Wiener, Norbert (1956). I am a mathematician: The later life of a prodigy (later republished by MIT Press ed.). Garden City, N. Y.: Doubleday and Co. pp. 317–318. MR 0077455. The mathematician Szolem Mandelbrojt was an uncle of Benoit Mandelbrot. ^ Siegmund-Schultze, R. (2009). "Alternative (non-American) host countries". Mathematicians fleeing from Nazi Germany: Individual fates and global impact. Princeton, New Jersey: Princeton University Press. p. 135. ISBN 978-1400831401. MR 0252285. William Feller wrote to Richard Courant: "Carleman is of the touching [rührend] opinion that one should execute [an die Wand stellen] all Jews and immigrants (which, however, he only tells his assistant after consuming a nonnegative [nichtnegativ] amount of alcohol)". ^ "Delaware's Medal of Honor Winners". delaware.gov. Retrieved 2008-05-21. ^ Liukkonen, Petri. "Raymond Chandler". Books and Writers (kirjasto.sci.fi). Finland: Kuusankoski Public Library. Archived from the original on 6 May 2008. ^ Rogan, Johnny (1998). The Byrds: Timeless Flight Revisited : the Sequel. Music Sales Distributed. p. 537. ISBN 978-0-9529540-1-9. ^ "Brian Connolly". Derby Dead Pool. Archived from the original on 2004-03-01. Retrieved 2008-05-15. ^ Upton, Julian (2004). Fallen Stars: Tragic Lives and Lost Careers. Headpress. p. 96. ISBN 978-1-900486-38-5. ^ "Golden greats". filmfare.com. Retrieved 2016-06-18. ^ "Singer Geeta Dutt, her life, her love and her unforgettable songs". timesofindia-economictimes. Retrieved 2016-06-18. ^ Hayward, Anthony (2002-09-11). "Michael Elphick". London: The Independent. Retrieved 2008-05-07. ^ Cullen, Frank; Hackman, Florence; McNeilly, Donald (2007). Vaudeville, Old & New: An Encyclopedia of Variety Performers in America. Routledge. pp. 383–386. ISBN 978-0-415-93853-2. ^ "F. Scott Fitzgerald - Biography and Works". The Literature Network. Retrieved 2008-05-07. ^ Parish, James Robert (2004). The Hollywood Book of Scandals. McGraw-Hill Professional. p. 92. ISBN 978-0-07-142189-8. ^ "GARRINCHA - International Football Hall of Fame". ifhof.com. Retrieved 2008-06-13. ^ "Alexander Godunov Biography (1949–1995)". filmreference.com. Retrieved 2008-05-08. ^ "Patrick Hamilton Biography and Bibliography at LitWeb.net". Archived from the original on 2008-05-04. Retrieved 2008-05-08. ^ "Slayer Guitarist Jeff Hanneman Died of Alcohol-Related Cirrhosis". Retrieved 2013-05-10. ^ Jasen, David A. (2003). tin pan alley: An Encyclopedia of the Golden Age of American Song. Taylor & Francis. pp. 184–5. ISBN 978-0-415-93877-8. ^ Massey, Peter; Wilson, Jeanne (2006). Backcountry Adventures Arizona. Adler Publishing. pp. 78–9. ISBN 978-1-930193-28-4. ^ Liukkonen, Petri. "O.Henry". Books and Writers (kirjasto.sci.fi). Finland: Kuusankoski Public Library. Archived from the original on 2 May 2008. ^ "Billie Holiday". Rock and Roll Hall of Fame. Archived from the original on 2014-05-28. Retrieved 2008-05-11. ^ "Drinking Problem? What Drinking Problem? : Published Works of Aaron Howard". Retrieved 2008-05-02. ^ Leith, Sam (15 December 2007). "Everyone should know their alcohol limits". The Daily Telegraph. London. Retrieved 2008-06-10. ^ Hawkins, Lee (2000-05-21). "The short, tormented life of computer genius Phil Katz". Milwaukee Journal Sentinel. Archived from the original on 2007-12-21. Retrieved 2008-05-11. ^ Bancroft, Colette (2007-09-02). "Witnesses to a legend: Jack Keroua". St. Petersburg Times. Retrieved 2008-05-11. ^ Lenburg, Jeff (2001). Peekaboo: The Story of Veronica Lake. iUniverse. p. 241. ISBN 978-0-595-19239-7. ^ "Axed TV star Tosh dies". BBC News. BBC. 1998-05-04. Retrieved 2008-05-11. ^ "Mickey Mantle, Legend of Baseball, Dies at 63". Washington Post. 1995-08-14. Retrieved 2008-05-13. ^ Rovere, Richard H. (1996). Senator Joe McCarthy. University of California Press. pp. 246–7. ISBN 978-0-520-20472-0. ^ Vengadesan, Martin (2007-02-04). "The poisoned chalice". thestar online. Retrieved 2008-05-19. ^ "Clyde McPhatter". Rock and Roll Hall of Fame. Retrieved 2008-05-14. ^ Belman, Felice; Pride, Mike (2001). Concord Monitor Profiles of One Hundred People Who Shaped The New Hampshire Century. UPNE. p. 215. ISBN 978-1-58465-087-4. ^ "The Hindu : The king of melody". www.thehindu.com. Retrieved 2016-06-18. ^ Boyden, Matthew; Kimberley, Nick; Staines, Joe (2002). The Rough Guide to Opera. Rough Guides. pp. 331–2. ISBN 978-1-85828-749-2. ^ Starr, Steve (2004-01-07). "STARR LIGHT Barbara Payton". Windy City Times. Retrieved 2008-05-19. ^ Evensen Lazo, Caroline (2007). 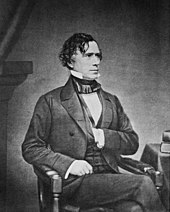 Franklin Pierce. Twenty-First Century Books. p. 101. ISBN 978-0-8225-1492-3. ^ "Actor Oliver Reed dies". BBC News. BBC. 1999-05-02. Retrieved 2008-05-20. ^ "Remembering legendary Shailendra – a great poet and lyricist". The Indian Express. 2015-05-01. Retrieved 2016-06-18. ^ "Jean Stafford". Internet Accuracy Project. Retrieved 2008-05-21. ^ Wintle, Justin (2002). Makers of Modern Culture: Makers of Culture. Routledge. p. 518. ISBN 978-0-415-26583-6. ^ Liukkonen, Petri. "James Thurber". Books and Writers (kirjasto.sci.fi). Finland: Kuusankoski Public Library. Archived from the original on 19 August 2006. ^ "Verne Troyer's Death 'Possible Suicide': 'Very High Level of Alcohol in His System,' Says Coroner". Meredith Corporation. Retrieved 2018-08-12. 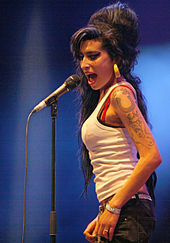 ^ "Coroner: Amy Winehouse died from too much alcohol". Associated Press. Retrieved 2011-10-28. ^ Bogdanov, Vladimir; Woodstra, Chris; Erlewine, Stephen Thomas (2003). All Music Guide to Country: The Definitive Guide to Country Music. Backbeat Books. p. 818. ISBN 978-0-87930-760-8. ^ Koon, Bill (2002). Hank Williams, So Lonesome. University Press of Mississippi. pp. 78–9. ISBN 978-1-57806-283-6. ^ Merrill, Elizabeth (2008-01-23). "Super Bowl XVII starter Woodley's life drifted after football". ESPN. Retrieved 2008-05-21. ^ Porter, Lewis (2005). Lester Young. University of Michigan Press. p. 30. ISBN 978-0-472-08922-2. ^ Strauss, Neil (1997-01-03). "Townes Van Zandt, Singer And Influential Songwriter, 52". New York Times. Retrieved 2008-05-21. ^ Lane, Jani (2011-08-10). "Jani Lane died of alcohol poisoning". CBS. Retrieved 2011-10-06. ^ "Vladimir Vysotsky The Biography". Mariya Shkolnikova. Retrieved 2013-04-26. This page was last edited on 14 March 2019, at 01:59 (UTC).